In late February, Dance for PD participated in a two-day symposium at Brown University called Widening the Circle. 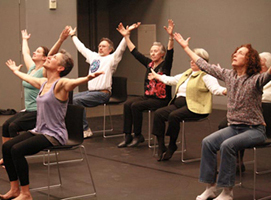 Presented in connection with the Mark Morris Dance Group’s appearance in Providence, RI, the event explored holistic, creative approaches that benefit people with Parkinson’s disease and those on the Autism Spectrum. Panelists included Dr. Deepu Gowda, from Columbia University’s College of Physicians and Surgeons; choreographer and teacher Pamela Quinn; Carolyn Adams, co-founder of the American Dance Legacy Initiative and former dancer with Paul Taylor Dance Company; and Dave Iverson, an Emmy Award-winning journalist and filmmaker. We also conducted presentations at the Institute for Human Centered Design in Boston, Syracuse University, Penn State Hershey Medical Center, and the Columbia University Program in Narrative Medicine (with Pamela Quinn as part of the program’s advanced workshop). If you’re interested in organizing a customized Dance for PD presentation for your organization or community, please visit our contact page and let us know. In Creating Dance: A Traveler’s Guide (Carol Press and Edward Warburton, eds. ), David contributes a chapter that traces a more personal, interior narrative based on his experience integrating his professional dance career into his work with the Dance for PD program. For more information, or to order, click here. 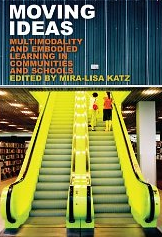 Both books offer a wealth of information and breadth of perspectives for teachers and dancers of all stripes. A new website provides an internet presence for the network of Australian Dance for Parkinson’s teachers who have launched classes on the heels of two successful Dance for PD workshops in Queensland and New South Wales in May. The network, managed by Erica Rose Jeffrey, currently offers classes in Sydney, Brisbane and Canberra, with additional classes planned for Hobart and Melbourne in 2014. The site contains class and contact information, among other resources. The Dance for PD program will adds its fifth location to its roster of New York City classes on February 20 when it begins a pilot series in Riverdale. The Riverdale pilot program, a collaboration among Mark Morris Dance Group, Brooklyn Parkinson Group, the Riverdale YM-YWHA, and The College of Mount Saint Vincent, features teachers trained in the Dance for PD approach and live musical accompaniment by Alan Eicher. Like all classes in the New York area, the Riverdale program is offered free of charge to people with Parkinson’s, their families, friends and care partners. Riverdale-based dancer Tara Sherman, a former member of New York City Ballet who later went on to pursue training and start a successful practice as a psychiatrist, will lead the class on February 20 with Leventhal. To register, please click here or call 1-800-957-1046. FirstWorks and American Dance Legacy Initiative, in collaboration with Artists and Scientists as Partners, Brown University, and Mark Morris Dance Group, present Widening the Circle: Intersections of Art, Science and Community. Widening the Circle is anchored by American Dance Legacy Initiative’s two-day Mini-Fest on February 28th – March 1st and FirstWorks’ presentation of an exhilarating evening of live music and dance with the Mark Morris Dance Group, one of the world’s leading dance companies, at The Vets on March 8th. A symposium on holistic, creative approaches that benefit people with Parkinson’s disease and those living with Autism Spectrum Disorders, developed by Artists and Scientists as Partners and led by David Leventhal (Brown ’95), Program Director, Dance for PD® and former Mark Morris Dance Group dancer will include master classes, lecture demonstrations and seminars. A week-long Mark Morris Dance Group repertory residency for Brown students will be hosted by Brown’s Department of Theatre Arts and Performance Studies. To conclude the project, the Mark Morris Dance Group joins FirstWorks for an evening of live music and dance. 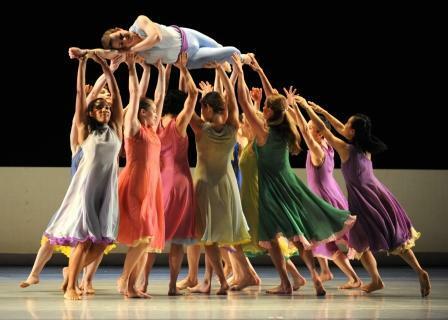 Mark Morris is a master choreographer of endless invention still brilliantly sculpting his legacy. Hailed as the “Mozart of modern dance”, he is committed to live music as an integral part of the dance experience. This celebration of joyous creativity is highlighted by Double from Morris’ masterpiece, Mozart Dances, set against rich visuals by British painter Howard Hodgkin and Morris, renowned as an intensely musical choreographer, conducting the Brown University Chorus to a glorious Bach motet. Throughout the year, Grantmakers in Health (GIH) in association with the National Center for Creative Aging, Grantmakers in the Arts and Grantmakers in Aging, has been exploring the intersection of creativity, health and aging through a series of panels, forums and presentations called Innovative Crossroads. The exploration utilized Dance for PD and TimeSlips, a trail-blazing program for people with dementia designed by Anne Basting, as exemplary case studies to highlight best practices and to bring persistent challenges (research and funding) to the attention of potential funders. GIH’s Colin Pekruhn lucidly articulates the consortium’s findings in this report. 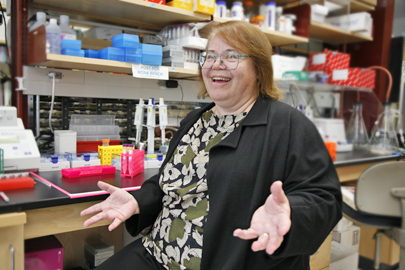 Dance for PD Advisory Board member Eve Marder has received the 2013 Gruber Neuroscience Prize. Dr. Marder, a professor of neuroscience at Brandeis University, received the $500,000 prize at the annual meeting of the Society for Neuroscience in November for her pioneering contributions to the understanding of neural circuits, in particular how the properties and dynamics of neural circuits give rise to specific behaviors. To learn more about Dr. Marder’s prize, click here. Our heartiest congratulations to Dr. Marder for this impressive achievement and well-deserved recognition. Members of Brooklyn Parkinson Group attended the dress rehearsal of the Mark Morris Dance Group in Morris’ L’Allegro, il Penseroso ed il Moderato at Lincoln Center. More than 20 members of the group are learning dances from L’Allegro in preparation for a performance next year and in honor of the work’s 25th anniversary. Meanwhile, MMDG dancers Sam Black, Lesley Garrison and Rita Donahue offered Dance for PD community classes as part of MMDG tours in Hanover, NH, Albany, NY, Austin, TX and Denver, CO. David Leventhal led classes in three London locations during MMDG’s visit to Sadler’s Wells. Three themes ran through this year’s World Parkinson Congress in Montreal: patient empowerment, the importance of staying active, and the value of community. That thread was captured beautifully by WPC Ambassador Bob Kuhn: “Illness begins with I, Wellness begins with We.” It’s no wonder, then, that WPC delegates were so enthusiastic about the Dance for PD demo class 65 of them attended, or the two screenings of Dave Iverson’s documentary Capturing Grace, or the panel of researchers and practitioners who addressed the value of dance in living well with Parkinson’s. Dance for PD seemed to represent the Congress’ zeitgeist–the intersection of empowerment, movement, and community that happen naturally in a dance class. We reinforced those themes through “Think Like a Dancer” table slips, short inspiring messages about integrating dance into daily life. These themes melded again during the last plenary session, when Pamela Quinn’s filmed duet with David Leventhal was screened as a vivid example of the choice to define oneself through confident action and individual expression in the face of challenge. 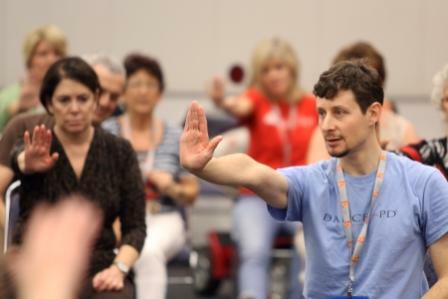 For an excellent summary of the WPC from the perspective of a person with Parkinson’s, read PD advocate Jon Palfreman’s Letter from Montreal. This year’s Congress in Montreal was the third such triennial event–and Dance for PD has had a presence at all three. In Montreal, there were 3,334 active delegates from 64 countries, including South Africa, New Zealand, Japan, Ethiopia, Argentina and beyond. Twenty-four nonprofit organizations, including Mark Morris Dance Group/Dance for PD and Brooklyn Parkinson Group, were represented. Over the course of the three days, delegates heard 188 speakers and saw nearly 600 posters. The next WPC will take place September 20 – 23, 2016 in Portland, Oregon.